Ecruteak City is very Japanese-themed. Start out by going into the house right next to the gym. The guy inside will give you the Dowsing MCHN, which helps you find hidden items. 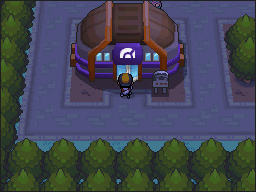 Go into the Dance Theater, north of the Pokemon Center. You'll encounter an argument between a Team Rocket Grunt and a Kimono Girl. Help her by fighting off the Grunt. Afterwards, as you try to get off the dance stage, an old man will give you HM 03 - Surf. 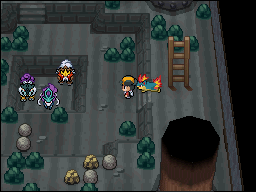 You won't be able to go to the gym yet; go find the gym leader in Burned Tower at the northern part of the city. Before just before you go there, first head east onto Route 42. As you walk near the cave entrance, a Hiker will jump out and give you HM 04 - Strength. Pick up TM 65 - Shadow Claw. Then, head back to Burned Tower. Enter Burned Tower and walk right. Eusine, a man in search of Suicune, will introduce himself to you. The gym leader, Morty, is standing nearby. Walk up the right side of the huge hole and Rival will challenge you to a battle. Rival has a lv. 18 Zubat, lv. 20 Gastly, lv. 20 Magnemite, and a lv. 22 Croconaw. After defeating him, go past the stairs, battle the trainer, pick up the Antidote, and battle the trainer on the other side. Smash the rock on the southwest corner to pick up an HP Up. Now head down the stairs. It's Entei, Suicune, and Raikou, the Legendary Beasts! Walk near them and they'll run away. Eusine comes down to talk to you about your encounter and runs away. Push away the boulders (push the bottom one left and the top one up), and pick up TM 12 - Taunt at the northwest corner. Now get out of there and go to the gym. Ecruteak Gym is really dark. You can only see small portions of it at a time as you walk through. The trainers here use Ghost Pokemon. Morty, the gym leader, has a lv. 21 Gastly, lv. 21 haunter, lv. 23 Haunter, and a lv. 25 Gengar. After defeating Morty, he'll give you the Fog Badge, which will allow Pokemon up to lv. 50 to obey you and give you the ability to use Surf. He'll also give you TM 30 - Shadow Ball. Now head west onto Route 38. Route 38 is a plain ol' route with trainers and items. It quickly turns into Route 39. As you enter Route 39, a man named Baoba, who runs the Safari Zone, will exchange numbers with you to notify you when the Safari Zone opens. Head west to the Moomoo Farm. 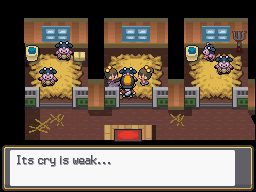 One of the Miltank is sick and unable to produce milk. You can help heal her by feeding her a bunch of Oran Berries. Once she's healed, you'll be able to buy Moomoo Milk here. At the southwestern corner, you'll find TM 60 - Drain Punch. 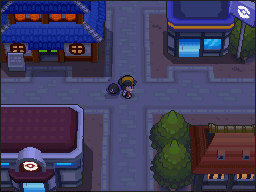 Now head all the way south, battle some trainers, and you'll get to Olivine City.